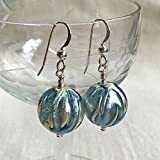 Classic blue with white gold leaf Murano glass sphere (14mm) earrings on 925 Sterling Silver shepherds hook ear wires. Customers must select gold-filled (22 Carat gold filled with 925 Sterling Silver) or Sterling Silver findings (ear wires, pins, etc., but not beads which remain as illustrated) before checkout. The item is shipped with a certificate of authenticity inside a luxury handmade box wrapped in plain tissue paper. There is no price label inside.